(National Geographic) Archaeologist Anya Shetler cleans an inscription below an ancient stucco frieze recently unearthed in the buried Maya city of Holmul in the Peten region of Guatemala. 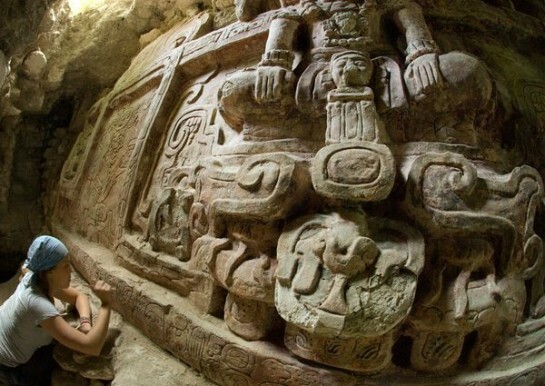 Sunlight from a tunnel entrance highlights the carved legs of a ruler sitting atop the head of a Maya mountain spirit. Maya archaeologist Francisco Estrada-Belli and his team were excavating a tunnel left open by looters when they happened upon the frieze. “The looters had come close to it, but they hadn’t seen it,” Estrada-Belli said.